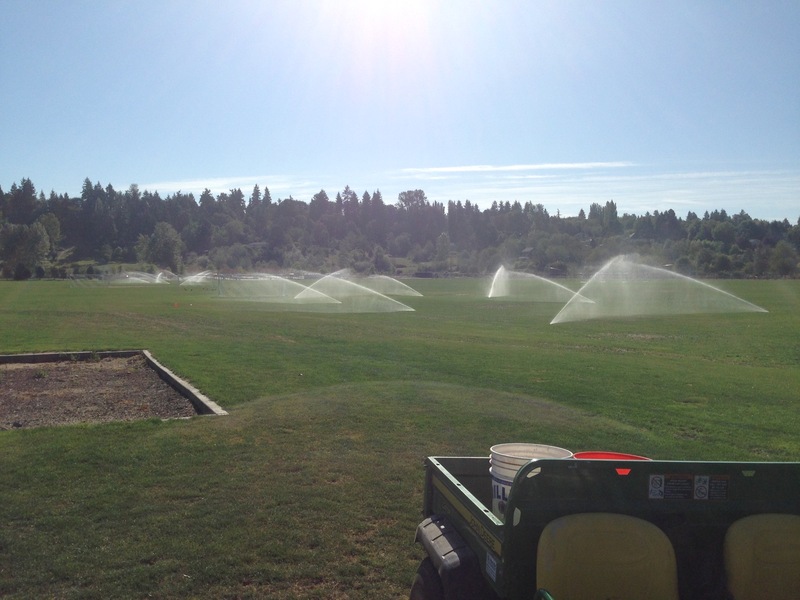 King County’s 60 Acres Park in Redmond using recycled water for soccer field irrigation. Summer is over, but the impacts of the record-setting drought continue to linger. Local utilities’ call for voluntary water use reductions is still in effect, and streams are struggling to recover for spawning salmon. But the 2015 drought is no match for the Lake Washington Youth Soccer Association (LWYSA). Serious about ending reliance on the salmon-bearing Sammamish River for irrigation, the association will now keep playfields green with recycled water produced at King County’s Brightwater Treatment Plant. Under a recent agreement, WTD will provide LWYSA with up to 8 million gallons of irrigation water through a pipeline that carries recycled water from the Brightwater plant north of Woodinville to Redmond through the Sammamish Valley. By tapping into this resource, LWYSA will be able to keep critically needed stream flow for migrating salmon in the Sammamish River. LWYSA provides organized soccer services to approximately 7,000 children in the area, and leases 60 Acres Park from King County Parks for its program. Recycled water, known as reclaimed water, is strictly regulated by the state Department of Ecology to ensure safety. As with lake or river water, recycled water is safe for human contact as well as irrigation on sports fields and even edible crops, but it’s not approved for drinking. Recycled water is distributed through a separate set of purple pipes to guarantee it will not be mixed with certified drinking water supplies. King County has been safely producing and distributing recycled water from its treatment plants for more than 20 years. Other King County recycled water customers include Starfire Sports Complex in Tukwila where the Seattle Sounders practice, and the Willows Run Golf Course in Redmond, which is one of the only certified Salmon Safe golf courses in the Northwest. City of Kirkland is the latest addition to King County’s list of recycled water customers. Under a joint agreement signed in September, city workers will have access to a truck filling station at King County’s York Pump Station in Redmond. Additional information about King County’s Recycled Water Program is available at http://www.kingcounty.gov/recycledwater.